Withymoor are Dudley Book Quiz Champions! 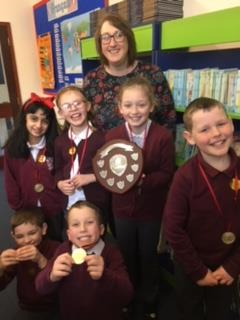 I am thrilled and delighted to announce that our team of super Year 3 and Year 4 readers have WON the Dudley Book Quiz final that took place this morning. Our clever, hard-working team of six children have shown great commitment to this competition. They have all read voraciously and developed a depth of knowledge and understanding of the relevant books that has equipped them to answer some very demanding questions. THEY BEAT OVER 20 OTHER SCHOOLS! What an achievement! I would also like to say a BIG thanks to Mrs Luckins who has accompanied and supported our children through every round.